While not exclusively a gay place, it's on the Castro side of Market Street. Clean, quiet rooms steps away from the action. Great room and super friendly staff, plus I love the vintage feel of being at a "Motor Lodge"! Will always stay here in SF! I have to say. I haven't stayed here/been to SF in like 5 years -- stayed here again because I love the location and WOW. Room was completely updated (looks like the whole room was gutted and renovated from floor to ceiling) and clean and chic. Very nice and very impressed. Amazing fresh clean bathroom, huge shower, and brand new temperature control systems. Not sure what they could have done to improve this even more - except maybe a rack to put your suitcase on (and that's being picky) . Front desk staff was very accommodating and helpful and friendly. Would definitely stay here again! dirty, bed bug infested rude manager. stains all over, escorts and drug dealers. Not worth the money. you'll regert staying here. I've had some of the most mind blowing you know what in this over priced moter lodge and thank God I wasn't paying ;-)> It has one thing going for it, location, and yes it's very cruisy. The people who run the place seemed uncomfortable, like they didn't know they were in a gay neighborhood until I walked in the door. I couldn't get the wi-fi to stay connected, and there was no air conditioning in my room. I got my money back and left. 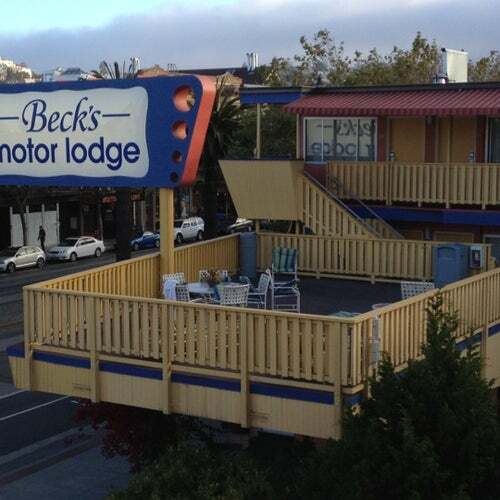 I stayed at Becks this week and for the first time in my life I was a victim of nasty homophobic attacks by a motel employee. The night-time front desk/security guy came up to me and a friend and questioned us for no reason. We are both clean cut "normal" looking guys and he had no motive to do so, other than the fact we were holding hands (we also over heard him say anti-gay remarks in filipino dialect). The security guy then called the police on my friend who was talking on the phone outside my door as he was about to leave. The police came and I was able to clear everything up, but it was obvious the Becks employee had an agenda. I have contacted several sources in Castro and I am encouring a boycott of this motel till they fire that homophobic employee. PLEASE DO NOT STAY AT THAT MOTEL and send a message that we won't tolerate that behaviour! My bf and I stayed at Beck's last Saturday night. It was close to everything, and we enjoyed it. We had a roon on the third floor in the back of the hotel. It was actually a very nice room. The hotel was not as "cruisy" as I have heard, but we did "hook up" with another guest that was staying there after running into him on the balcony at 2 am. I would definitely stay here again. Unexpected Comfort!!! Great for the price and loc. I didnt know anything about this place until we got there. The 3 of us, me, my partner and best friend. The room was spacious, bed comfortable, bathroom clean. Friendly receptionist and very hospitable. They hold are bags in the back until check-in time. After staying at the Whitcomb, we cameback here for more nights. It was close to castro, restaurants and transportation. No one bothered us on the weekend. My experience here was just very pleasant. Highly recommend it. My partner and I stayed here for 5 days. Cruising goes on quite a bit, but if you keep your door closed, you will be left alone. This is not the Ritz, but it was clean. The staff was very helpful and the location is the best!!! The street cars are right across the street and the hotel is right in the middle of the Castro District! The location is good in terms of proximity to the bars (walking/stumbling distance), but there are always a select few that cruise. if you don't want the hassle close your doors when you get in your room.